Most blue-green algae products contain Aphanizomenon flos-aquae harvested from Upper Klamath Lake in southern Oregon. Harvesting is done during the summertime, June to November. 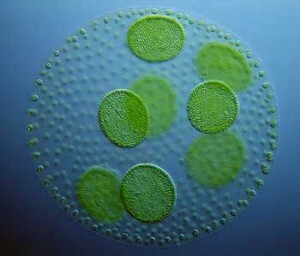 The algae is filtered to preserve the most vibrant blooms and then further purified by centrifugation. The AFA is then chilled and sold frozen or dried at low temperatures and sold as a powder. Blue-green algae is 70% vegetable protein and has higher levels of beta-carotene than broccoli. The one-two punch potency of blue-green algae is that it contains a high concentration of nutrients- over 65 vitamins, minerals and enzymes and the complete spectrum of eight essential amino acids and ten nonessential amino acids… and they are all easily absorbed by the body. In fact up to 97% of the beneficial vitamins, minerals and enzymes found in blue-green algae are easily absorbed (some supplements are as low as 5-25% absorbable). AFA also contains the most biologically active chlorophyll of any known food. Although blue-green algae is commonly consumed in the United States, Canada, and Europe, some concern has been voiced about the potential for presence of microcystin, a toxic byproduct of blue-green algae. In response, the Oregon Health Division and the Oregon Department of Agriculture have established regulatory limits on microcystin content in BGA products. As with most products, if you’re pregnant or nursing, it’s a good idea to first consult your health care provider before supplementing with blue-green algae. You should only consume AFA and spirulina from trusted and reputable suppliers. I personally use and recommend E3Live, which is harvested from Lake Klamath. E3 is a stand-up company I trust because of their solid ethical foundation and practices. If you choose to supplement with blue-green algae, you won’t be disappointed in the quality of their product. Baroni L, Scoglio S, Benedetti S, Bonetto C, Pagliarani S, Benedetti Y, Rocchi M, Canestrari F. Effect of a Klamath algae product (“AFA-B12″) on blood levels of vitamin B12 and homocysteine in vegan subjects: a pilot study. Int J Vitam Nutr Res. 2009 Mar;79(2):117-23. doi: 10.1024/0300-9831.79.2.117.